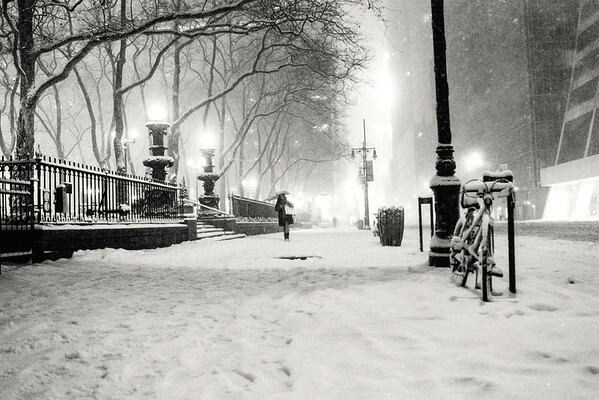 New York City resembles a snow-globe when snow first falls. As the snow swirls, the trees reach over the city streets as if they are trying to catch snowflakes with their bare, graceful branches. This was taken at night during a winter storm in New York City that dropped enough snow to turn the city into a winter wonderland momentarily. This is the area on 42nd Street next to Bryant Park across from the Grace Building which can be seen partially on the left-hand side of the image. It's one of my favorite spots to snow-gaze at night. Nice low POV. Excellent composition.